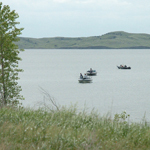 The sixth annual Denny Palmer Memorial Walleye Tournament is on tap for Saturday on Lake Oahe. Up to 150 two- or three-man teams will vie for more than $9,000 in cash and prizes. As of today, there are 15 spots left as 135 teams are signed up to compete.